"If you're serious about either learning chess or playing a challenging opponent on these platforms, tChess Pro by Tom Kerrigan ... is not only fabulous, but it's the best computer Chess program this reviewer has ever encountered." For those who want a simple and no frills interface but with a fast and powerful chess engine with many standard features, you won't go wrong with Tom Kerrigan's tChess Pro! Solid chess apps are few and far between on the iOS, but tChess Pro is one of those rare games that really takes full advantage of the iPad's spacious screen. Whether you're playing against the challenging AI or your friends, tChess Pro gets every knight and rook right. 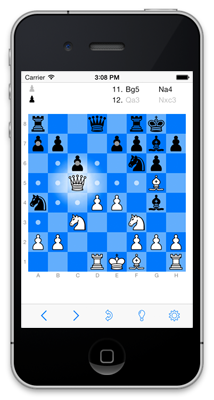 tChess Pro gets thumbs up for iPad users! tChess Pro makes reviewing games so convenient that I gave away the small analysis chess set which I formerly used.